There's a 50% discount on these exams if you take them at either VMworld event. You can now post "ideas" in the VCP and VCAP areas of the VMTN forums - suggestions that other users can vote on, that will be seen directly by the programs managers at VMware. Compare the objectives in the exam guides for the regular and delta exams for VCP6.5-DCV, and you won't see any difference - does this mean the exam items themselves are the same, or are the delta exam items just a subset of those in the regular exam? The exams were written by different teams, to slightly different criteria - as the delta exam is only for existing VCP6-DCV holders it is more focused on the upgrade content between vSphere 6.0 and 6.5. All "proctored" VMware exams delivered at Pearson VUE testing centres have been extended, giving more time to all candidates. Here are a couple of job aids that will help you share your certifications with recruiters/employers, or your mum! 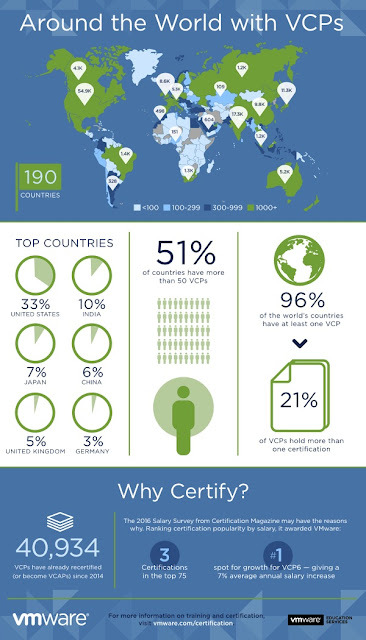 Remember when VMware published a VCAP infographic in April 2016? Well, it's time for the 2017 version - check this post here. I like the table showing the different solution areas - no surprise that DCV takes the top 2 spots, but it's NV that is a clear 3rd in spite of it's relative lack of maturity - clearly SDN is popular! I received an email last week from Katie Bradley - she helps to manage the VMTN Community forums. I'd been nominated and selected to be a Community Warrior, mostly for my contributions on the Training & Certification forum areas over the last 10+ years. Katie made the announcement via this post on the VMTN blog, and has also created a new Community Warrior Program area within the communities themselves. 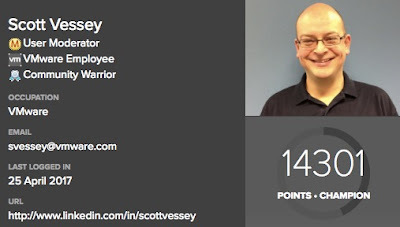 You can view my VMTN Community profile here, complete with it's shiny new Community Warrior badge. Thanks to Katie for all her efforts, and to Jill Liles for the nomination! Here's their blog post on the stats. Spam - it ain't what it used to be! 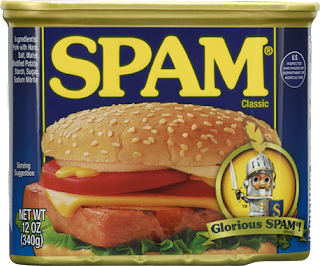 Even if you've never eaten it, you might have seen the famous Monty Python video. SSDN Technologies seem to be my biggest fans - they just won't stop posting spam comments. I've asked them to stop - they never appear to you guys anyway, as I moderate all comments first (for exactly this reason). SSDN ignore my emails, and when I tweeted them they just blocked me - charming eh? They're not alone of course - plenty of SEO companies and other training companies try too.